The paleontologist Jose Patricio O'Gorman, researcher at the Museo de la Plata (MLP) and CONICET, told to the Agencia CTyS-UNLaM that "this plesiosaur record is 80 million years older than what was known for Antarctica". "It was the first paleontological campaign that we conducted in this outcrop that is like a frozen sea of 150 million years in an excellent state of conservation", said the lead author of the study that was accepted to be published in the scientific journal Comptes Rendus Palevol. Dr. Soledad Gouiric Cavalli, MLP and CONICET specialist in the study of Jurassic fish, claimed that "when walking through the site you can find a great diversity of fish, ammonites, some bivalves, but we did not expect to find a plesiosaur of such age; It was surprising". 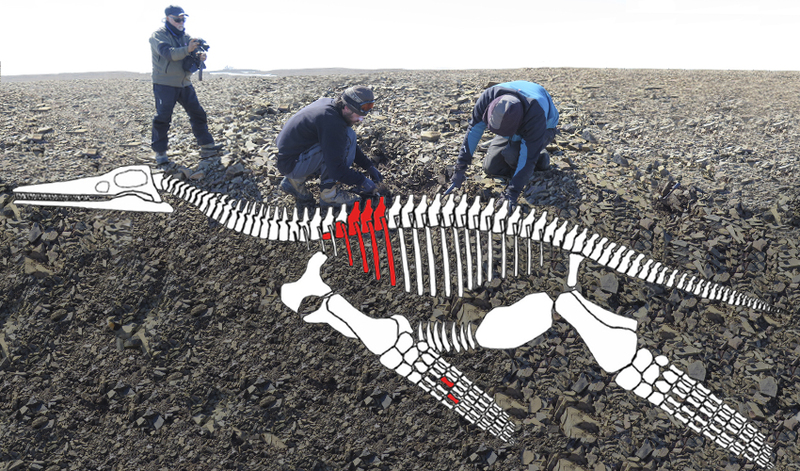 "The finding is quite extraordinary, because in the site there is not the kind of rocks in which you can find preserved materials in three dimensions, as is the case of the vertebrae of this marine reptile", explained the researcher. This outcropping of the Jurassic has a size of four kilometers long and two kilometers wide and it can only be reached after two hours of helicopter flight from the Marambio Base, so the researchers highlighted the logistics promoted by the Argentine Antarctic Institute (IAA). There, during the 2016 summer Antarctic campaign, Dr. Gouiric Cavalli, Dr. Jose O'Gorman and the technicians Juan Jose Moly and Leonel Acosta Burllaile camped for 40 days. "It was very exciting to get there, to a place that nobody had stepped on in 23 years", O'Gorman said. "It is the furthest place where we have arrived with vertebrate pelontology campaigns in Antarctica", alleged Dr. Soledad Gouiric Cavalli. She added: "The Argentine campaigns are usually carried out in the vicinity of the Marambio Base (in the Marambio, James Ross and Vega Islands), but here we have expanded the range of action and we are interested in going to places even further away". Dr. Marcelo Reguero, researcher of the MLP and director of the paleontological campaigns of the Instituto Antartico Argentino (Argentine Antarctic Institute - IAA), said that "it was necessary to make a lot of logistics to get to this new paleontological site located in Cape Longing and the result was very successful, have rescued a great diversity of fish, plants and this plesiosaurus, and this summer we will go to the new campaign with even greater expectations". "In the 2016 campaign, a large amount of fossils was obtained and for the expedition next summer we will go with instruments to obtain an even greater number of specimens", anticipated the researcher of the MLP and the IAA. Dr. Gouiric Cavalli, who will be part of the new campaign to be held in this frozen Jurassic sea from January 8 to mid-February, indicated that "there is a surprising amount of fish there and it is logical to think that the plesiosaurus that we discovered would feed on them, because it is a large marine reptile and we found medium-sized fish, some smalls, and some quite large too". About the excellent conservation of this fauna and marine flora of the Jurassic, the MLP and CONICET researcher explained that "they were preserved because the bottom of that sea had very little oxygen, so there were no organisms that could dismantle those specimens and the phenomenon of putrefaction did not take place either ". Dr. Marcelo Reguero stated that "these rich and unique deposits in marine Jurassic vertebrates belong to the time when Antarctica was part of the Gondwana continent and was next to Australia, New Zealand, India, Madagascar, Africa and South America". 150 million years ago the temperature of the seas was much higher and the world map was very different. According to Dr. Jose O'Gorman, this plesiosaurus, besides being the first of its kind in the Jurassic in Antarctica, serves as evidence in favor of the possibility of the dispersal of these reptiles by means of a passage that existed between Africa and Antarctica, which at that time had just separated.